It’s not easy to find a marketing agency that offers a complete service. You pick a website designer. They set you up with web hosting via a third-party and it runs nicely for a year, but what happens when it malfunctions and you’re on your own? You have somebody create a logo for you. But when you go to a company to get some flyers printed, the logo isn’t in the right format and they tell you it needs to be provided differently. Sounds a lot of hassle? 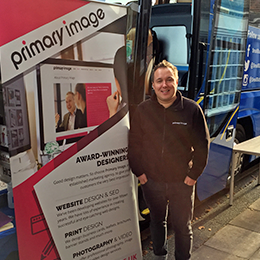 After many years running a successful freelance design business, that’s why I founded Primary Image in 2010. I wanted to offer customers a more convenient and complete service, where we take care of making your business look great, and you can concentrate on running your business. You can trust us to create professional designs that look great. It’s no surprise that a lot of our work is in web design and development, which is where most of today’s marketing now happens, but good design principals can of course be applied to all other types of products. That’s why we expanded to offer logo design, business cards, banner stands and other services that we knew would genuinely be useful to our customers. Our expert designers have access to professional-grade software and we partner with one of Europe’s largest printers. Traditional design agencies have tried the opposite, by moving from print design and adapting to the new digital world. However, they often lack the essential technical skills of building solid and reliable websites that work well, especially on mobile devices, because they still design websites like printed brochures. We’ve designed award winning websites for our customers. We strongly believe in offering the best customer service we can. Choosing a budget design company is often a false economy, and especially so with cheap overseas companies. They look to churn out the same designs over and over again, moving fast onto the next project, and sacrificing that attention to detail and proper checking. We’re different. We like to keep our customers happy and build long term partnerships. 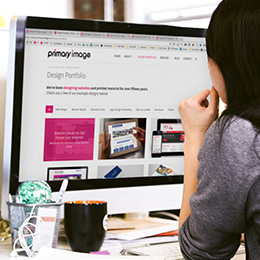 When you choose Primary Image, you’ll be allocated a designer who will be your personal contact. We aspire to be great, not big, and always aim to be the best at what we do. We take the time to get to know your business so we can properly understand what design is going to work best for your audience. And because we not only build websites, but we host them too, we’ve got that added incentive to make sure your website is built reliability! That’s why our customers choose to stick with us because they know they won’t get the same quality of service elsewhere. We have been designing websites and promotional material for over fifteen years. We’ve designed websites for some of the biggest brands in the UK, including National Express, Transport for London and many others. 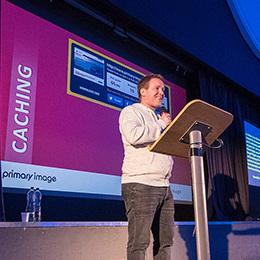 We’ve given talks at some of the biggest web design conferences on the calendar to share our expert knowledge, such as pictured here in Birmingham. We work in both Southend-on-Sea, in Essex, and Limehouse, in East London. Though of course it doesn’t really matter what part of the country (or world) you’re in! We work with clients, large and small, from all across the UK. How long has Primary Image been trading? Primary Image was formed in 2010, although it evolved from Mike’s previous design business running since the early 2000s. 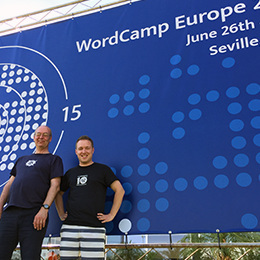 We’re interested in hearing from any WordPress developers in the Essex area. If that’s you, please send us a CV and some links to your work. We recognise that our work has an impact on the environment, so we’ve taken proactive steps to minimise this. For instance, the data centre we use for hosting websites has strong environmental credentials, including operating with certified Green Energy, and uses extremely energy-efficient web servers. For virtually all our print products, we’ve chosen a factory that uses 100% FSC certified paper. This means your paper comes from sustainable sources, as recognised by the Forest Stewardship Council scheme. In addition, our print supplier is ISO certified in Environmental Management Systems. We also do things such as offsetting the CO2 emissions from most of our parcel deliveries; send out invoices electronically; and recycle everything we can. Many of our customers are increasingly specifying eco-friendly sources and so we’re happy to offer this as standard. Sure, just contact us and we’ll be happy to help!